Olsson & Wurtz. 1951. New Colombian Naiades, with observations on other species. Notulae Naturae (239): 1-9. Chevronais colombiana Olsson & Wurtz, 1951. Olsson & Wurtz, 1951, Notulae Naturae: 6, text fig. 3-6. Type(s): HOLOTYPE (ORIG. DESIG.) ANSP_187181, Rio Caqueta, above Tres Esquinas, Colombia. 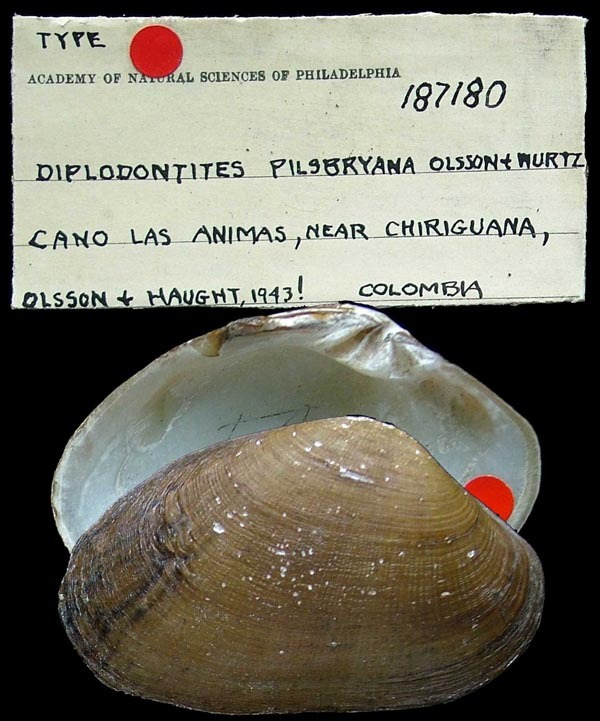 Diplodontites pilsbryana Olsson & Wurtz, 1951. Olsson & Wurtz, 1951, Notulae Naturae: 7, figs. 7-10. 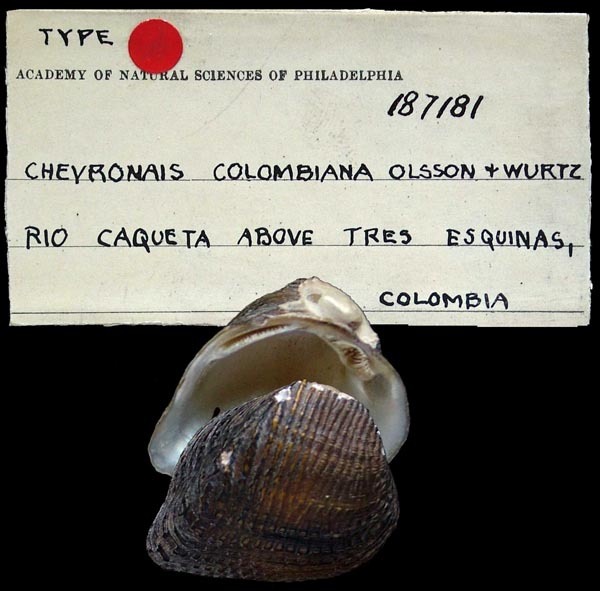 Type(s): HOLOTYPE ANSP_187180, Cano Las Animas, near Chiriguana, Colombia. 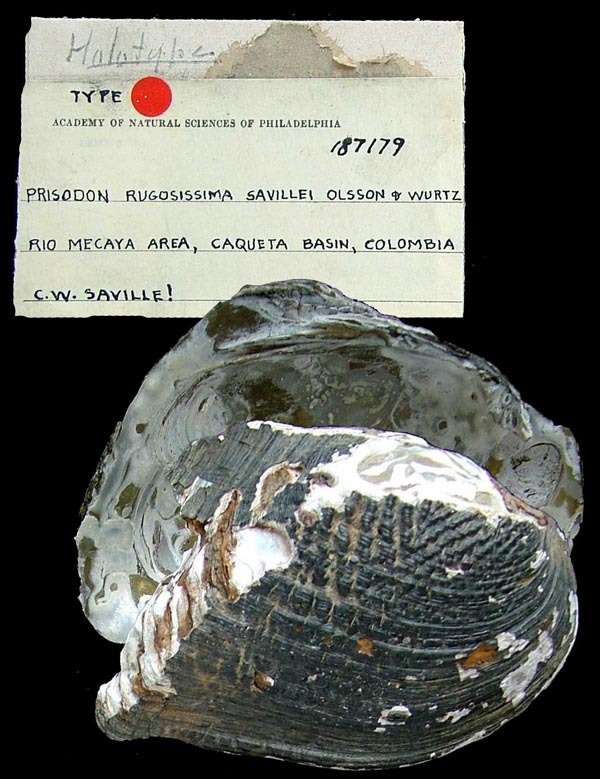 Prisodon (Triplodon) rugosissima savillei Olsson & Wurtz, 1951. Olsson & Wurtz, 1951, Notulae Naturae: 5, figs. 11-12. Type(s): HOLOTYPE ANSP_187179, Rio Mecaya Area, Caqueta [= Japurá] Basin, Colombia. Anodontites colombiensis Marshall, 1922. — Olsson & Wurtz (1951: 8). Chevronais colombiana Olsson & Wurtz, 1951. — Olsson & Wurtz (1951: 6). Diplodontites cookei Marshall, 1922. — Olsson & Wurtz (1951: 8). Diplodontites pilsbryana Olsson & Wurtz, 1951. — Olsson & Wurtz (1951: 7). Prisodon (Triplodon) amazonia (Frierson, 1914). — Olsson & Wurtz (1951: 6). Prisodon (Triplodon) rugosissima (Sowerby, 1869). — Olsson & Wurtz (1951: 5). Prisodon (Triplodon) rugosissima savillei new subspecies. — Olsson & Wurtz (1951: 5).